Some nights you just want a quick easy dinner without a lot of work (okay, a lot of the time). This is one of my go-to recipes on those nights. It's easy and doesn't require too many ingredients (and I've learned to keep them all on hand!). And I've even come up with a second variation! Enough instant potatoes to serve 6 (I buy the big box of instant potatoes for these nights. You can use less or more but 6 servings is just enough) and whatever ingredients your instant potatoes require, usually milk, water, butter and salt. Preheat oven to 350. Brown meat in saucepan (now's a good time to prepare the instant potatoes simultaneously). Drain. Add garlic and onion and saute until the onion is soft. Add sloppy joe sauce and cook for a couple minutes until heated. Pour mixture into a pie pan (or a baking dish!). Add potatoes on top of meat. Grate cheese and add on top of potatoes. 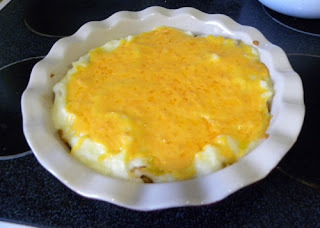 Place in oven until cheese is melted. And enjoy! The second variation was an accident but is another family favorite (and is actually preferred by some members of the family over the original recipe!). You prepare everything the same way, but instead of using sloppy joe sauce and beef you use enough pulled pork to cover the bottom of the dish, covered (once it's been cooked and pulled) in barbeque sauce. To prepare the pork, I cook a pork loin in either root bear or apple juice, let it cool and then pull it. I then place it in zip lock bags and freeze it for future meals. I pull out one bag for this recipe, reheat it with the barbeque sauce, onions and garlic and then layer the recipe in the same way!